Follow this blog. We’ll post all the news and information coming out of convention each day, and try to post as many photos as we can. You can find the latest headlines from the blog right on our home page, in the bottom left-hand corner. Like us on Facebook and follow us on Twitter. Each day, we’ll be posting real-time updates on our social media profiles as well, in addition to meatier updates here. On Twitter, you can use the hash tag, #AchieveInclusion, to follow the conversation centered around the event. If you’re at Convention, and tweeting, please join the discussion. Don’t forget to share your photos there too! Follow our new blog focused on chapter called We Are The Arc. We’ll post photos as we get them there. Use the Convention website. Our event website is still the best place to go for all the particulars, like the schedule, list of sponsors and exhibitors and more. We’re looking forward to seeing everyone this year! Blue Beanie Day 2011, celebrated by The Arc's web crew: Kevin Wenzel and David Kennedy. Today, The Arc’s web team donned blue beanies. Kevin Wenzel (The Arc’s web producer) and I got a few strange looks, even after he sent out a staff-wide email explaining why web designers and developers everywhere put on blue beanies today. Colleagues keep asking us and we’ll keep telling them why. We support web standards and the hats signify that we’ll follow that set of best practices for standardized, accessible, universal web design and development. In the past 18 months, The Arc has made a lot of progress toward doing a better job embracing web standards. We redesigned our main website, rolled out three new blogs and launched two additional sites – keeping web standards in mind from the very beginning. Right now, we’re working hard toward making small tweaks on the back-end of our sites that will make a big difference when it comes to web standards and web accessibility. We’ll share more on that as we move forward. In the meantime, at least you know why web staffers everywhere are wearing blue beanies, and why Kevin and I look a bit like lumberjacks today. The Arc has achieved so many great things this year with your help and support. We’ve rolled out a new brand, unveiled new public service announcements, created a fantastic resource for people with autism and other developmental disabilities, released an authoritative study of people with intellectual and developmental disabilities and so much more. Like us on Facebook and follow us on Twitter. Each day, we’ll be posting real-time updates on our social media profiles as well, in addition to meatier updates here. 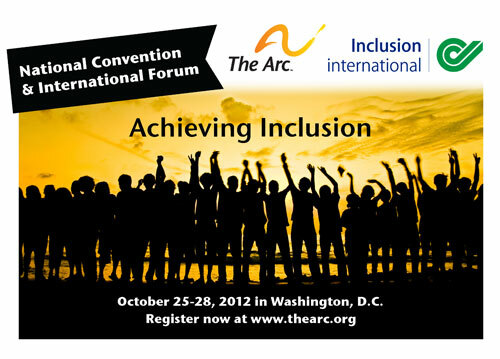 On Twitter, you can use the hash tag, #thearc11, to follow the conversation centered around the Convention. If you’re at Convention, and tweeting, please join the discussion. Autism Awareness Month is a time for learning about autism and introducing others to new ideas as well as a celebration of individuals on the autism spectrum. It’s also the perfect time to discover Autism NOW’s new website. Autism NOW is a national initiative of The Arc funded by a grant from the Administration on Developmental Disabilities charged with becoming the nation’s source for resources and information on community-based solutions for individuals with autism, other developmental disabilities and their families. One of those topline resources is a series of webinars about autism spectrum disorders (ASD), early detection and intervention, and organizations and activities supporting acceptance and celebration. Sign up for a free session held every Tuesday and Thursday from 2:00 p.m. to 3:00 p.m. (EST) throughout Autism Awareness Month. Designed for self-advocates, families, professionals, and the general public, these webinars encompass a wide variety of topics and practices in the area of autism spectrum disorders (ASD) and developmental disabilities. Space is limited and we’re sure you won’t want to miss these opportunities. Check out the full list of available Webinars and sign up now at www.autismnow.org. While you’re there, take some time to explore the new website then spread some awareness to the rest of the world. You can like us on Facebook, follow us on Twitter, read our latest news and share our URL with everyone you know. Together we can raise awareness for autism for April and beyond! Just 14 days ago, The Arc launched a new brand. Many of our chapters have embraced the new look and feel, and generated lots of excitement around its official unveiling Match 1st. Just one of those chapters is The Arc of Indiana. Be sure to check out the new look on its website, and listen to the interview Michelle Fischer did with The Arc’s CEO Peter Berns. Berns talks about The Arc, its brand and the story behind our new look. 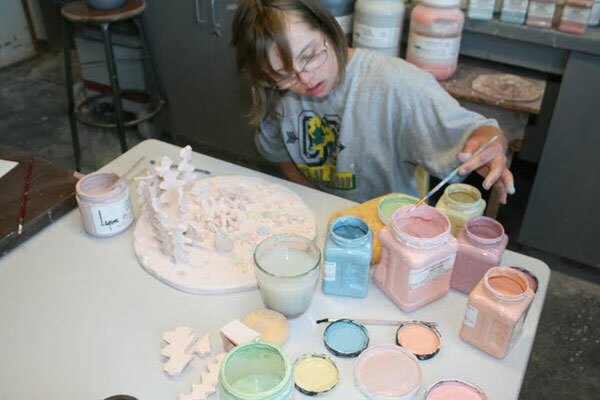 Eliza Schaaf works on one of her projects. Every student wants to learn. Every artist wants to create. Every person wants an opportunity to be the best they can be. The administration at Southern Oregon University have denied Eliza Schaaf all three. Eliza graduated high school this year, loves expressing her creativity and decided to take that to the next level in college by enrolling in an art course called Introduction to Ceramics. Eliza has Down syndrome, and had attended previous classes with the help of a personal assistant. Eliza’s art projects were progressing nicely (see the photos for proof! ), and now all she wants to do is finish them. You’re totally missing the point. That’s what The Arc would like to say to the administration at Southern Oregon University. It’s not just about what she might reasonably be expected to learn. It’s not just about how much she “gets” out of what’s going on. It’s not just about academic progress. It’s about allowing her to participate in the college experience to the best of her ability, alongside classmates who support her. Visit Eliza’s blog, and read her story. Sign the petition in support of her continuing class. Spread the word via social media. Share this post with your Facebook friends. Make a donation to The Arc, so we can help Eliza, and cases like hers, directly.